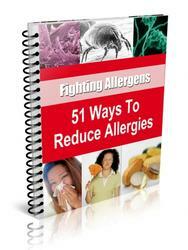 Removing known allergens is of prime importance because it can eliminate symptoms. When exposure is unavoidable, environmental control should reduce symptoms and prevent exacerbations. The patient or the family must assume responsibility for environmental control, so an understanding of allergens is helpful. Commonly inhaled allergens include pollens, which can produce symptoms of seasonal allergic rhinitis, conjunctivitis, and asthma. Allergenic pollens come from trees, grasses, and weeds. Pollens from flowering plants are insect-borne and are not important allergens. Pollen prevalence is usually determined by gravity slides, which sample pollen fallout without regard to wind direction, speed, and turbulence, so that daily reports of pollen prevalence often do not reflect the true concentration in the air or individual exposure. Inhaled fungal allergens in fungus-sensitive subjects can produce seasonal symptoms during situations that promote fungal growth, such as humid and rainy weather and exposure to hay, mulch, commercial peat moss, and compost. Indoors, areas of spore formation can be identified at sites of water condensation such as shower curtains, window moldings, and damp basements. In addition, cool-mist vaporizers can serve as sources of fungal contamination. A prime role for the patient and family is controlling house dust. House dust is a heterogeneous mixture of bacteria, fibrous matter of plant and animal origin, human epidermis, food remnants, fungi, insect debris, and animal dander and contains one major source of antigen: the dust mite. Mites are ubiquitous in households and are most prevalent in bedding, mattresses, carpeting, and upholstered furniture, particularly where warmth and humidity are high. Air conditioners and dehumidifiers are useful for these patients. High-efficiency particulate air (HEPA) filters are effective in removing dust and animal dander. Fans should not be used so that these lightweight particles can settle. Minimizing clutter and removing carpets are also effective measures. Linens should be washed in hot water (130° F, 55° C). Impermeable cases can be used for pillows and mattresses. The use of a mask over the nose and mouth with replaceable microfoam filters significantly reduces the effects of temporary exposure to inhaled allergens such as dust or pollens. Animal allergens are derived from dried saliva on shed cat fur, rodent urine, and epidermal material from farm animals. The allergic respiratory reactions produced by animal allergens are species specific. Finished furs and wools are not allergenic. Feathers are often nonallergenic when fresh, and they produce allergic symptoms only after degradation. A careful history to identify environmental allergens is important for advising avoidance and treatment.